This is another of those books that teaches me something I didn't know I needed, or wanted, to know. Isn't that the best thing about finding books that pique our interest and inspire? 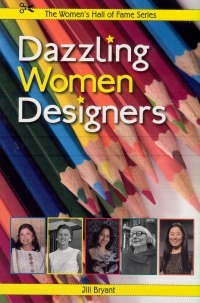 Here are women from all over the world who have a need to try new and imaginative forms of expression. Some are living, some are not. Some are famous around the world, some are known to a smaller audience. Each is a beacon to those who follow; they share their ideas and inspiration and offer a promise that hard work and vision are worth pursuing. They live in all parts of the world and have found success in very distinct areas of design: robotics, landscape, architecture, textiles, fashion, graphic design, creating furniture and making plans for urban areas. Their stories are told with reverence and clarity. This is the sixteenth book in this series, and it is a shining example for the depth and range of women who make our world a better and more beautiful place. "She pioneered built-in shelves, hidden cupboards, multi-purpose furniture, and reversible and extendable designs." Moving forward in time we meet the other women chosen for their much admired contributions to world design, ending with Cynthia Breazeal, a robotics specialist whose most notable work to date is Leonardo...a robot that is 'part toy, part machine, part creature who can smile, talk and recognize familiar faces'. The photographs, sidebars and quotes add interest. Such a diverse group of women they are; and we become more familiar with their many successes and the women themselves as they worked in their chosen field. The back matter is in keeping with other books in this much appreciated series, letting readers know the source of the information shared and where they can find out more about each included designer, as well as providing acknowlegements and photo credits. Anticipating a career in design? Here is inspiration!